304-881-0093: Scam or debt collector or both; User on Whitepages reports “…initially offered a rewards card if I gave them my VISA/MASTERCARD number for a shipping fee…” Also reported on 800Notes.com. Two footnotes…. Supporting the idea that “online privacy is an oxymoron,” it was reported recently that security flaws exist in all browsers that allow nefarious parties to pull up your browser search history. Oh joy. Secondly, we made a collection of the Nigerian 419 advance-fee scam emails we received during the last month. It’s a fun read! Enjoy! 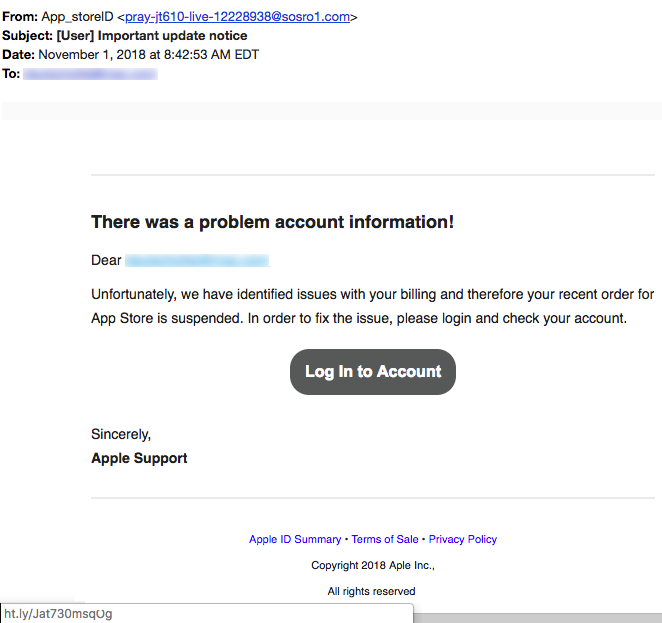 “There was a problem account information!” says an email from sosro1[.]com. 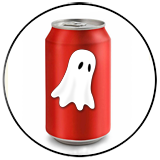 Sosro.com is an Indonesian beverage company. However, sosro1 doesn’t seem to exist. The link for “Log In to Account” points to a web page on the free service HootSuite. 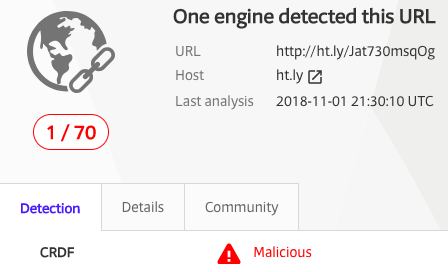 At least one service reported to VirusTotal.com that the link is malicious! We’ve seen similar emails like this targeting Wells Fargo users. 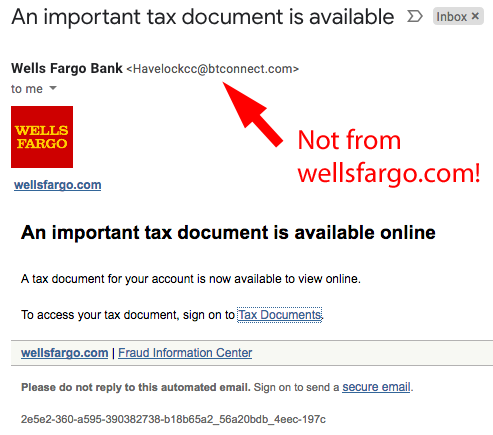 This one clearly didn’t come from WellsFargo.com. The link for “Tax Documents” pointed to the link shortening service tiny.cc and that link points to a well documented phishing site! All links pointed to Google Ad Services in this malicious Grinch in sheep’s clothing. We’ve seen the misuse of Google Ad Services in the past, so this isn’t unusual. 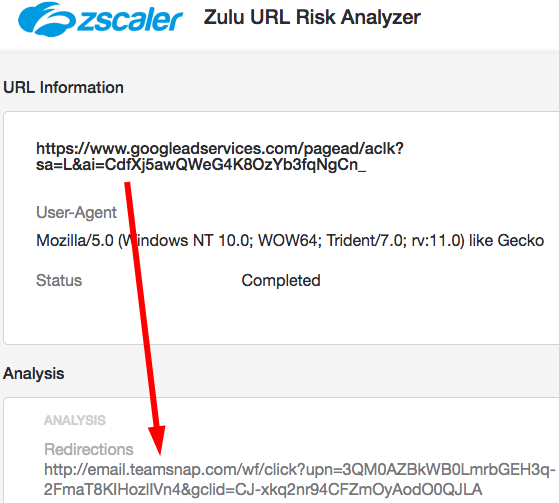 The link will then forward you to a hacked website for a youth sports service called teamsnap[.]com. 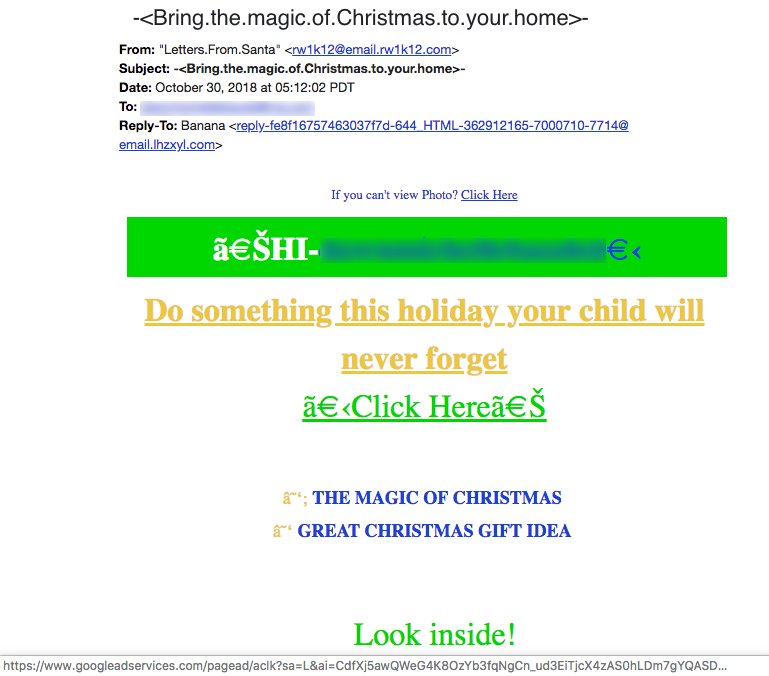 “Do something this holiday your child will never forget”… infect your computer! Now this is a true oxymoron! When has Donald Trump ever spoken about an improved medicare plan, whether his name is associated with it or not? According to Wikipedia, Donald Trump has made a total of 62 “thank you” tours, post inauguration rallies and midterm election rallies since being elected in 2016 and through November 5, 2018. All of them are documented on the Wikipedia site. While we cannot claim to have watched his speeches at all of these, we have read and seen summaries of the issues he addresses at many of these rallies. Promoting a “Trump Medicare Plan” is not one of these issues. In fact, according to PolitiFact.com, the recent billion dollar Republican tax cut will mean that Medicare (and social security) will run out of money sooner rather than later. Also, Trump’s top Medicare official, Ms. Seema Verma, slammed the idea of “Medicare for all” in the summer of 2018, according to Boston.com. (To his credit, Trump has said multiple times that he wants to reduce the cost of pharmaceutical drugs.) 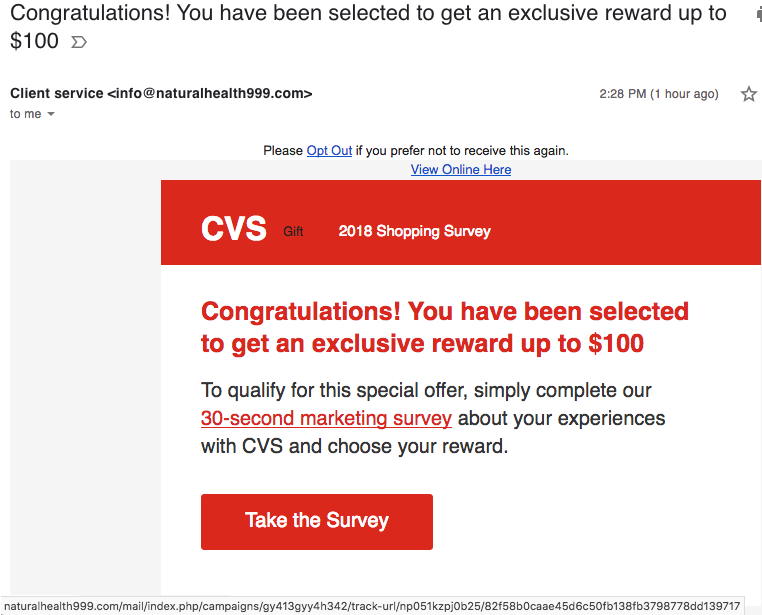 So what’s going on with this promotional email that wants you to believe it came from the website Trump-Medicare-Plans[.]com? That’s the point. 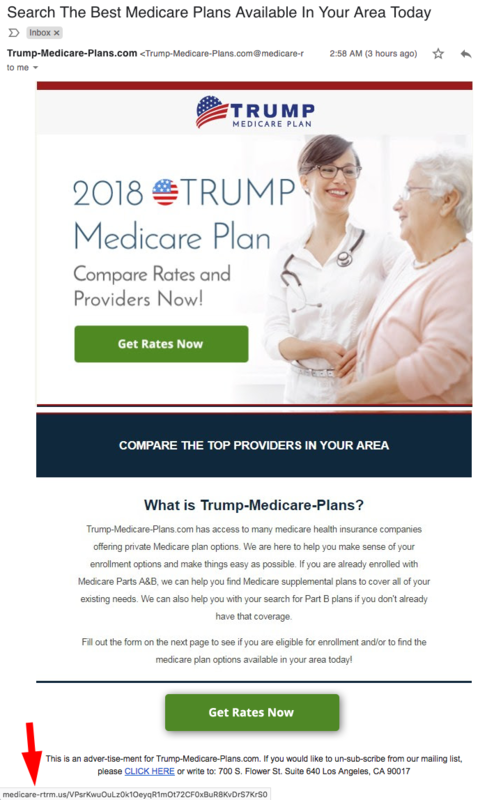 It didn’t come from that website, even though the graphics in the email and the website it points to look like the same graphics found on Trump-Medicare-Plans[.]com. 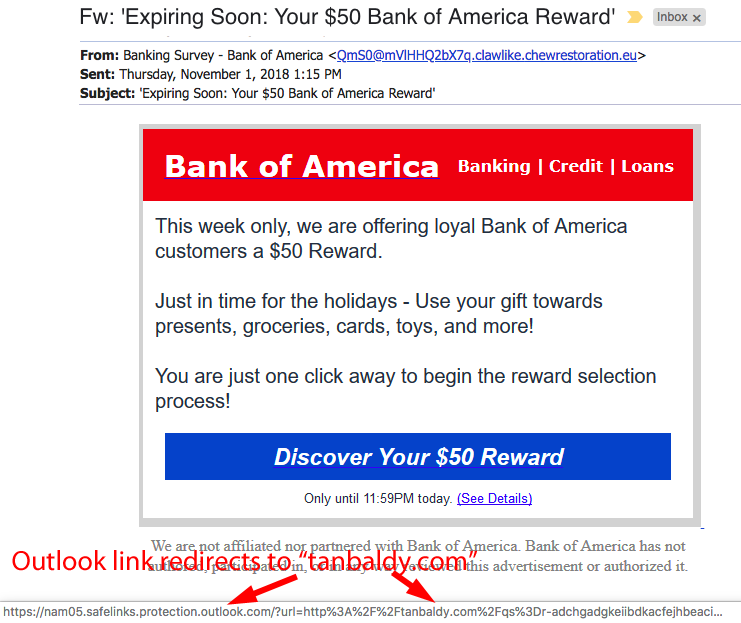 All links point to the website medicare-rtm[.]us. 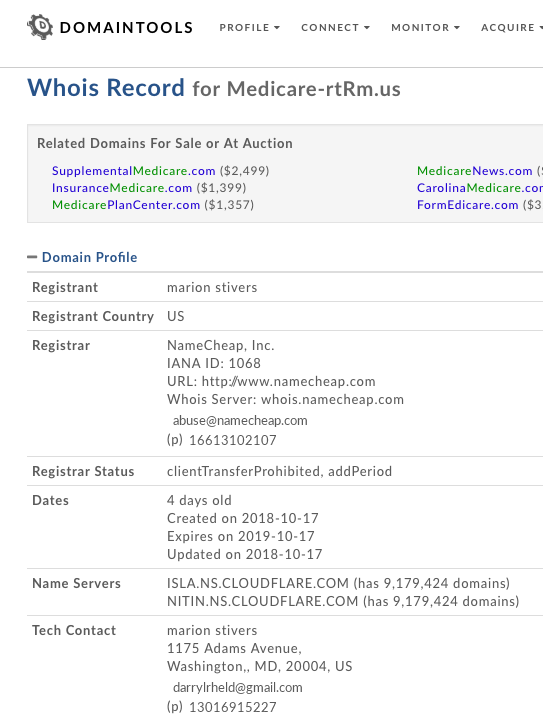 This other website was registered to someone identified as “marion stivers” from Maryland on October 17, 2018. It has already been taken down but we found that it contained a redirect to another website called Compsabid002[.]com. 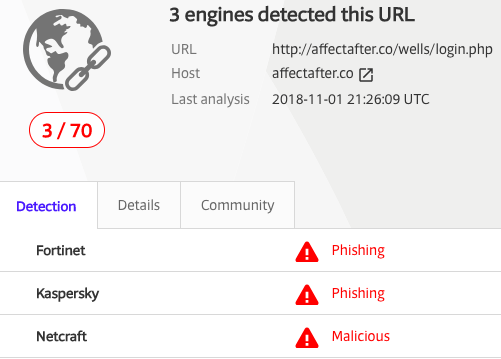 We have twice reported on this malicious website in the last nine weeks. (September 5, 2018 newsletter and August 29, 2018) Compsabid002[. ]com is a VERY malicious website and was registered on July 30. It is being hosted in Holland. If you visit that redirected link, here’s what greets you from Holland. 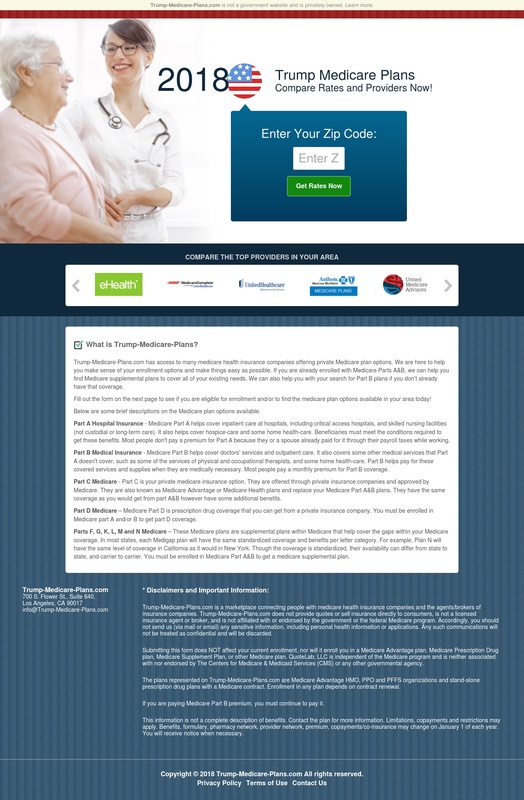 It appears identical to the real website Trump-Medicare-Plans[. ]com but it is a malicious mimic! 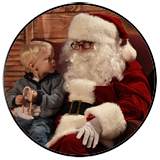 Once again, a healthy dose of skepticism can go a long way to ensure your safety. Ahhhh, Vanna White. Hostess of Wheel of Fortune since 1982. If you believe this clickbait, then you’ll think that she is either stepping down from that role, has died, or got fired by NBC. 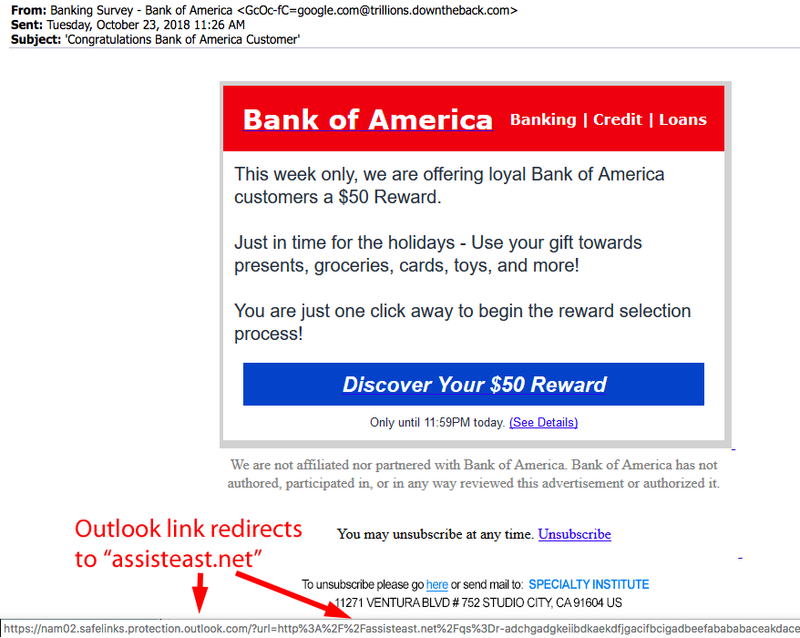 Two small letters of the alphabet should inform you that this email is HIGHLY suspicious and shouldn’t be clicked. Can you locate the two letters? 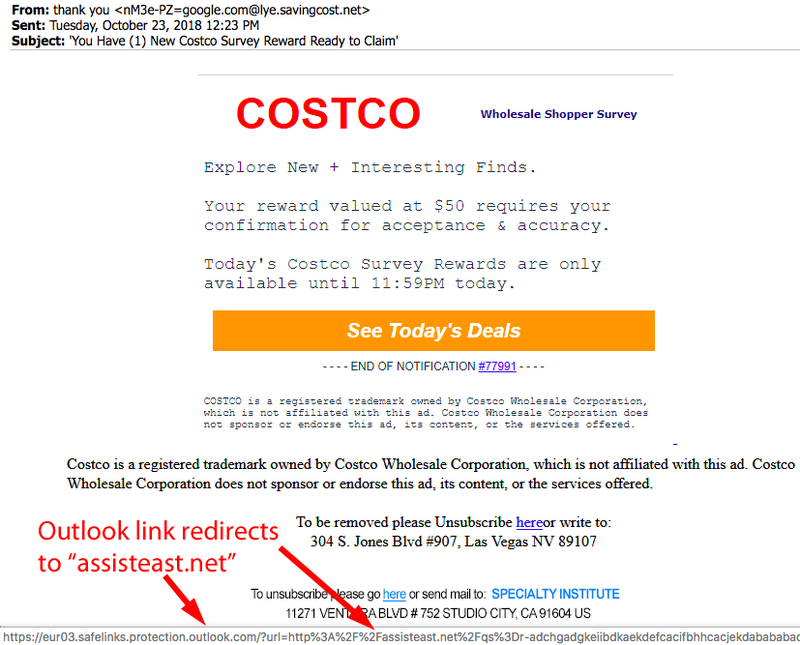 Both the FROM address and website to which all links in this email point contain “.uk”. Dot “uk” is the 2-letter country code for United Kingdom. 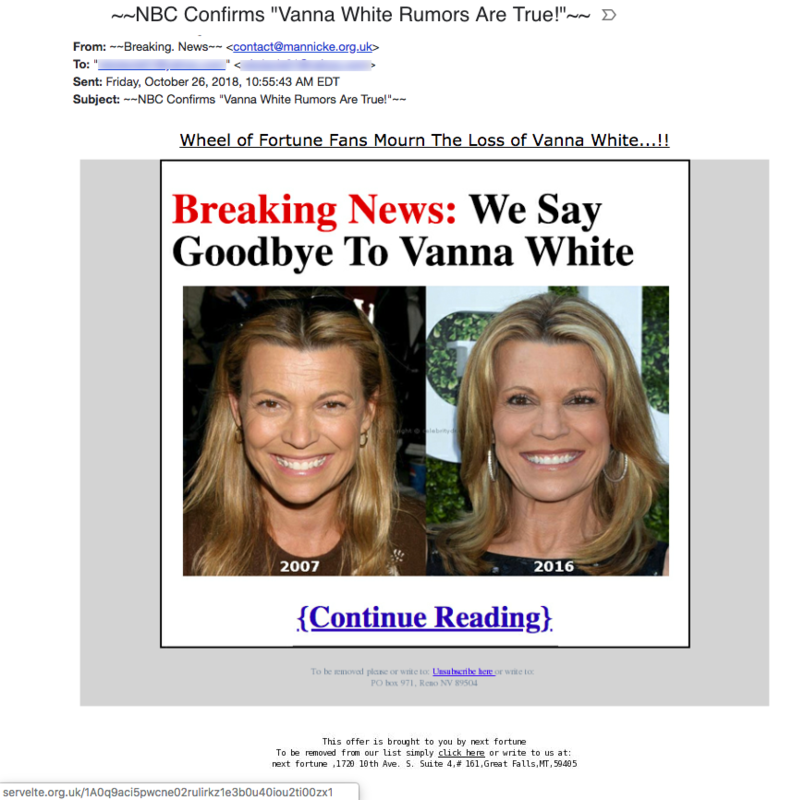 Isn’t it a bit odd that an email about an American actress and long-time game show hostess should come from, and links point to, a website in the UK? The links point to servelte[.]org[.]uk. 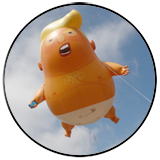 This website was registered in the UK on August 8, 2018 and is actually being hosted on a server in Nuremberg, Germany. Stay skeptical!